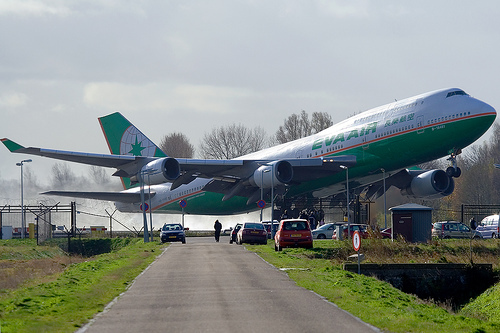 This picture was taken in the weekend that air traffic at Amsterdam Airport suffered many delays. The reasons were technical problems in the Air-Traffic-Control system and weather. When I went to the airport I hoped to make photos of weird looking cross-wind landings on runway 06 and sun-lighted aircraft in front of dark skies. I got what I wanted. Before going home I paid a “visit” to runway 36L. At the “ijweg”road. I knew when using enough tele-mm’s this place can result in interesting pictures. Although I was “disappointed” about the position of the sun I gave it a try. I prepared a fast shutter speed using iso 400. Fortunately a 747 was taking off. The rotation point was early, and the runway was still wet. Click on the photo to view a larger version at the photographer's Flicker.com page.